Violence erupted between the two communities after a Coptic church was burned down on Friday, but tensions have been simmering for months. Around 1,000 demonstrators from the Coptic Christian community gathered outside the Cairo Minister of Information on Monday. VIOLENT CLASHES BETWEEN Christian and Muslim groups in Cairo have killed 11 people and injured over 90, according to local security and medical officials. Officials who spoke to the AP on condition of anonymity said that six Christians and five Muslims had been killed, and the majority of those injured were Muslim. The BBC reports that eyewitnesses said both sides had been throwing stones and the army fired warning shots into the air, but medical sources have said that the dead died from gunshot wounds. Following months of escalating tension between the two communities and the destruction of a Christian church on Friday, violent clashes broke out in Cairo yesterday. A suicide bomb attack on a Coptic Christian church in Alexandria killed at least 21 people on New Year’s Day and later that month an off-duty policeman shot a 71-year-old Christian man dead and wounded his wife and four other people. Friday’s church fire is believed to have stemmed from a controversial love affair between a Muslim and a Christian, which sparked off a feud between the two families in which two people were killed, Al Jazeera reports. The police have yet to fully regain control of the streets of the Egyptian capital following the 18-day democracy which saw former President Hosni Mubarak resign last month. 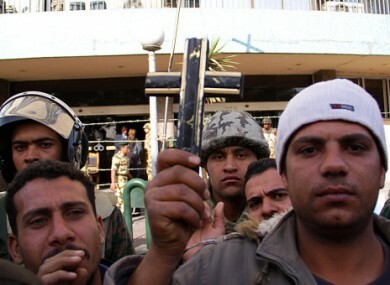 He ceded power to the military, which does not have enough troops to man every street in Cairo. Egypt’s caretaker leaders have already pledged to rebuild the torched church, but their promises have not eased the situation. Email “11 killed in violent clashes between Muslims and Christians in Egypt”. Feedback on “11 killed in violent clashes between Muslims and Christians in Egypt”.